Is an interest association of producers and other co-operatives. It was founded in 1953 and currently has about 100 member cooperatives. The focus of its work is oriented on methodology, coordination and information. It systematically helps member co-operatives and guides them in the economic, legislative, legal fields, in financing, tax issues, payroll, accounting and statistics, in the field of standardization and certification. It participates in the creation of various projects which are financed through EU funds. It helps co-operatives to solve problems related to the employment of people with disabilities. It organizes educational activities for members, the development of sports and recreational activities. CPS is a nonprofit organization whose activities are financed by contributions from member co-operatives and its own activities. CPS brings together co-operatives with diverse production activities and activities related to providing services. It provides them with acquisition, mediation and information services in various fields, coordinates the participations of co-operatives in various contracts, trade fairs and exhibitions at home and abroad. CPS works closely with the Ministry of Labour, Social Affairs and the Family, the Ministry of Economy, the Ministry of Education, the Slovak Chamber of Commerce and Industry, the Slovak Investment and Trade Development Agency, the National Agency for the Development of Small and Medium Enterprises, as well as with universities, especially with the University of Economics in Bratislava. Its foreign relations are long-term. CPS takes part in the work of the international organization for industrial, craft, service and producers co-operatives (CICOPA) within the activities of the International Co-operative Alliance as well as within the European Confederation of Producers and social co-operatives and participative enterprises of the European Union countries (CECOP). The representative of CPS represents the interests of Slovak co-operatives in Management Board Cooperatives Europe, the main co-operative organization which links co-operatives in Europe. 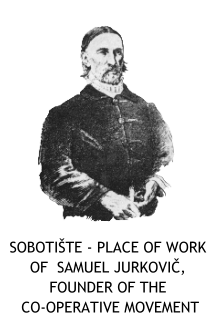 The beginning of the existence of consumer co-operatives dates back to 1869, when the Slovak scholar Samuel Ormis founded in Revúca the first consumer co-operative in Slovakia called Potravný spolok. Other communities and co-operatives were created according to the principles of voluntaryism, reciprocity, autonomy, common ownership and democracy. Later, the Slovak union of consumer co-operatives was created whose members became the consumer co-operatives JEDNOTA. By the merging of the Slovak Union of Consumer Co-operatives, co-operative company, and COOP CENTRUM, a.s. on 18th December 2001 a new organisation called COOP JEDNOTA Slovensko was created, which is currently composed of 34 consumer co-operatives. In foreign relations, it works closely with the member countries of the International Co-operative Alliance in an international organization of consumer co-operatives (ICCO). COOP Jednota Slovensko is also an associate member of the EURO-COOP. Since 1918, when housing co-operatives were created, housing co-operatives have undergone various stages of development. In 1968 the Slovak Association of Housing Co-operatives came into existence, which was gradually transformed into an interest association. Currently it consists of 109 housing co-operatives. The association’s activity is financed by income from its own activities and its assets, as well as from contributions from member organizations. The professional services of the association are systematically provided to member organizations regarding legal, technical and economic areas, and the association organizes and provides training for the officials and executives of co-operatives. The association actively co-operates with the Slovak government and ministries. Through membership of the Association of Employers' Alliances of the Slovak Republic it represents the interests of its members at tripartite negotiations in the Council of Economic and Social Agreement of the Slovak Republic. The association is also represented in the International Co-operative Alliance, an international organization of housing co-operatives (ICHO) and is an active member of CECODHAS (the European Committee for Social Housing). The Union of Agricultural Co-operatives and Companies of the Slovak Republic is a voluntary, independent and autonomous organization bringing together 600 agricultural co-operatives and 50 companies. The Union provides its members with legislative, judicial, economic, advisory, education, mediation and other services. It defends the interests of member co-operatives when drawing up agricultural programmes, mechanisms and instruments of economic policy. It represents its members in negotiations with the Slovak government in the Council of Social and Economic Agreement, the Association of Employers' Union of the Slovak Republic and the Slovak Chamber of Agriculture and Food. ZPDaOS SR develops its activities at the international level; it is a member of the International Co-operative Alliance, an international organization of agricultural co-operatives (ICAO), EUROMONTANA, and co-operates with COPA, COGECA and other organizations. KOOPERATIVA Insurance Company, Plc. Vienna Insurance Group offers more than 60 life and non-life insurance products to citizens, individuals and legal entities. It provides services to almost 1,5 million clients. First private universal insurance company in Slovakia, KOOPERATIVA poisťovňa, Plc. Vienna Insurance Group was established on October 30th, 1990. The majority shareholder is one of the most important insurance companies in Austria, Vienna Insurance Group AG Wiener Versicherung Gruppe, with representation in Central and Eastern Europe. In 2001, the VIG group in Slovakia joined the KOMUNÁLNA poisťovňa, Plc. Vienna Insurance Group. The combined share of the Vienna Insurance Group companies in Slovakia as of the date December 31st, 2017 exceeded the level of 33%. Vienna Insurance Group (VIG) is the leading insurance specialist in Austria as well as in Central and Eastern Europe. Approximately 50 companies in 25 countries forms a concern with long tradition, strong brands and marked closeness to clients. VIG builds on his 190 years long experience in the insurance field. With approximately 24,000 employees, the Vienna Insurance Group is a clear leader in its markets in Austria and also in Central and Eastern Europe countries. His excellent position allows him to fully exploit from the long-term growth potential of region with 180 million residents. The listed Vienna Insurance Group is the top rated company in the ATX Vienna Stock Exchange main index; stocks are also listed on the Prague Stock Exchange.